So most common LT's are useless when becoming level 100+. They're so easy to get, they're also meant to be bad, most of them are fusing food, but where do you fuse them into? So I'm wondering which common LT's you guys do think are still useful in some loadouts, and which ones you think are the most useless. With all the complaining lately I think it's nice to discuss good aspects of the game! I use only Penelope, Throttle and Charmaine. All others lts have too low bonuses to be used in any setup I have. depends on your perspective, myself I did the john, mia, colt to 9 stars as they were easy to do as at the beginning I didn't have any stats as I was pure energy and stamina so those common Lts helped alot, as time goes on and it depends on your disposable income you could star those few up to 9 and then start removing them over time for uncommon Lts and Rares over time and high starring those but thats a long term strategy and one i'm currently doing. I have 4 accounts, each playing different roles in my empire. Commons I use regularly amongst them are penelope, charmaine, backfire, donavan sometimes throttle aswell for extra alloy, the rest are mainly garbage. I think John, Mia and Fang benefit from their special equipment. Most people are probably working past the useful of those LTs by the time they get that equipment though. I still have a 9* John seated on one of my accounts but he will be phased out soon I think. I use 9* in my health setup. Rocky gives a nice boost to health. John fang ak and Mia. With their equipment they are my best lts. I am working towards their medals. With the medals I am expecting 1k boost for John ak and Mia. And it will just keep increasing as I collect more lts. Penelope for the xp. Other commons are not really important for my set up as I play reaper class. 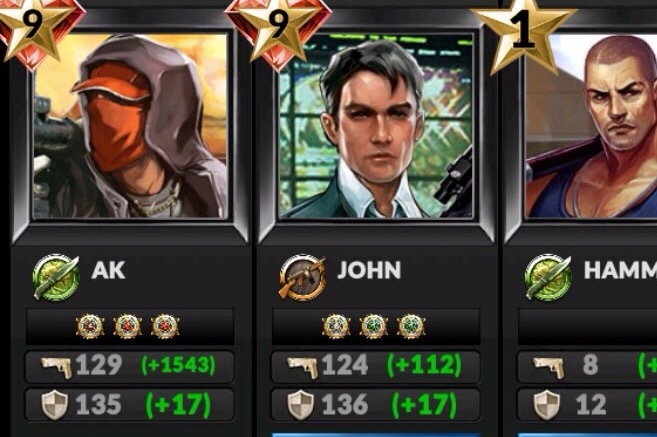 John, Mia, AK, Fang with special weapons and faction insigna are a significant step above the ordjnary 9 star common. Is a 9* Backfire common LT worth it for a lv200 or any level demo? You don't have better lts? Crossbones, because I don't like waiting for things. Hansel and Gretel, bonuses to energy and stamina, both are Mafia which work well with Enzo/Mafia Insignia boost. Donovan, if you need money. Last edited by Guy; 08-03-2016, 02:26 PM. Go seat a 9*AK in the assassin's seat if you have his weapon. Tell me if he is worthless then. I have seen attack bonuses well over 1000 for him there.